This set contains the four colors that are essential for painting models of vehicles used by the Ger.. This set contains the three basic camouflage colors used for painting vehicles and other equipment u.. This set contains the four most common variants of the famous Dunkelgelb (Dark Yellow) color, used .. 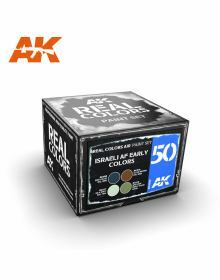 This set contains the four colors that are essential for painting the interiors of models of vehicle.. This set includes the four colors that are indispensable for painting models of the aircraft used by.. This set contains the four camouflage colors that were most commonly used for painting all Luftwaffe.. This set offers the modeller the three colors which were officially specified as the basic camouflag.. This set contains the four camouflage colors that indispensible for painting models of Soviet fighte.. This set contains the four camouflage colors that had been most commonly used for painting US aircra.. This set contains the four camouflage colors that are essential for painting models of aircraft used.. This set contains the four colors that are indispensable for painting the cockpits and other inner s..